We thrive on complex design and usability research problems at the intersection of human capability and advanced technological functionality. Some of our projects have resulted in industry-leading solutions that have impacted entire global networks. Others have produced new innovations in terms of methodology or process that have become industry best practices. We go where there is complexity so that you can return with simplicity in terms of customer acceptance and business performance improvement. We employ rigorous, science-based research and development methods appropriate for the complexity of your critical business problem. Since our founding in 1975, we have been a leading provider of rigorous product design, software development and formal usability testing methodologies. We have pioneered the use of various core technologies including eye-tracking (1976), structured usability metrics (1977) and online, large-sample user testing (1995). Over the past 20 years we have pioneered several advanced testing methodologies including advanced eye-tracking, cognitive modeling, EMG and EEG and standardized human factors engineering heuristics and evaluation methods. All utilized in the development of solutions focused on solving the complexity problem for leading high-technology institutions, non-profits and governmental agencies. We have executed many complex programs under structured and government-mandated product development, human factors engineering, and usability testing frameworks. These include the application of formal guidelines and regulations from the Department of Defense, NASA, the Food and Drug Administration and the Nuclear Regulatory Commission. When applicable, we can and do apply rigorous statistical analysis of relevant large data sets based on professionally executed consumer research. Founded in 1975, chances are we have worked in your industry sector or product category in groups ranging from the world’s leading stock exchanges to the social media apps for COPPA age Children. Our experience covers UI design and human factors performance verification for a wide range of user profiles and industry sectors including UI design for highly complex financial service applications, social media interfaces for teens, cross-platform media consumption interfaces for millennials, complex medical imaging and drug delivery systems, mission-critical process control and energy applications, user interfaces for large scale virtual reality networks and avatar creation interfaces, complex military systems, aerospace systems including NASA, product/screen-based interface combinations, complex CSR applications, and complex data visualization and decision-making interfaces for leading high-technology institutions and investment firms. The following project thumbnails cover high-profile and other relevant program experience. Clicking on the red dot with the “+” will take you to in-depth data. In a multi-year engagement, MUS executed business-critical human factors engineering research and complex user interface design programs resulting in the creation of a new generation of screen-based (fixed and hand-held) trading systems that dramatically improved trading performance, reduced training time and reduced errors. Solutions verified by independent usability testing. Core concepts implemented by other major exchanges and trading platforms worldwide. MUS received Interactions Design award from Association of Computing Machines for this effort. Conducted multi-year longitudinal usability testing and UX optimization research for multiple primary MTV media properties. Applied advanced cognitive modeling methods in optimization of teen interactions with new media sites. Conducted extensive usability and information transfer analysis of online content categories and presentation formats focused on defining information structures that had the greatest impact on clinical outcomes of cancer patients. Conducted extensive research in global financial service markets related to complex futures spread trading behaviors. Developed high-performance trading interfaces which resulted in production of multiple utility patents for GUI design. It has now become clear that the most successful products in all major categories ranging from consumer products to large-scale process control applications must deliver high levels of customer experience optimization focusing primarily on the application of robust human factors engineering science. One of the most complex problems top management at any leading high-technology company faces today is how to successfully integrate professional human factors engineering best practices into their ongoing design and development programs. At MUS UX Labs we have developed a robust human factors engineering process integration program based on more than 40 years serving world-class high technology clients. Our formalized process covers current product design/development processes audits, critical incident analysis, core HFE problem analysis followed by extensive implementation planning covering: staffing and training requirements, testing facility development, HFE best practices and design audit systems, integration with required regulatory and policy processes, matching with quality control and production audit systems, management alignment exercises, academic outreach and other critical implementation phases. The service, developed under our UX Labs program has been applied to world-class clients in a wide range of industries. The process model undergoes frequent update and realignment based on changing market priorities in the high-technology product design and development problem space. In a multi-year engagement, executed international UX design, usability research and user engagement optimization programs for Citibank online services. Reported to the highest levels of the bank including Office of the Chairman. Developed primary interaction framework for Citibank home banking utilized on a global basis. Conceptualized and developed large internal teams of subject matter experts, HFE staff and related testing facilities. Citibank online customer experience rated number one on a global basis during period of involvement. 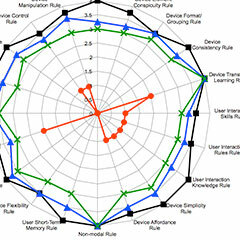 Conducted extensive competitive UX analysis of 32 MP3 players benchmarked against new entrant to the market. Produced robust cognitive model of UX performance impact on purchase decisions covering player/online music service combinations. Accurately predicted demise of MP3 player market based on UX performance of new entrant. Developed and executed usability study focused on verification and optimization of new UX design for new in-store photo kiosk. Study focused on testing of UX in wireframe and final formats with emphasis on rapid response (AGILE) updates based on objective user behaviors determined through formal usability testing. Utilized comprehensive lab-based testing methodology based on information-seeking behavior analysis. Conducted large-sample international usability and engagement analysis of complex financial website and protected interactive content. Designed and executed study covering 5 global customer markets in the U.S., Asia, Europe, South America and the Middle East. Executed complex factor analysis leading to identification of key factors and provided detailed optimization strategy. Executed detailed UX heuristics analysis of world-famous rock musician’s promotional web presence. Created brand attributes profile matrix of artist’s key engagement variables and matched to design of existing web presentation. Provided detailed recommendations for enhancement of web presence as required to bring web presentation into alignment with artist’s perceived brand attributes and key audience image variables. We have executed extensive ergonomic analysis and optimization in many complex process control workstation environments covering fossil and nuclear power generation, high-volume production process in a wide range of industry sectors. Our experience covers entire control center/room design, workstation design, large-field view displays and workstation configurations. We have conducted research in numerous highly secure, confidential environments on a global basis. Executed extensive ergonomic analysis and optimization of a wide range of operator control environments ranging from tractors to high performance flight deck design. Executed detailed analysis and benchmarking studies focusing on optimization of cognitive, biomechanical and anthropometric factors in complex operator control environments. Executed complex benchmarking study of large e-com website directed at identification of critical task failures and related customer interaction pathways leading to low customer retention rates. Designed formal usability study framework based on business-case modeling and customer experience optimization model. Executed large-sample, lab-based study utilizing observational recording of user behaviors correlated with eye-tracking data. Research methodology based on cognitive model of search in complex data sets. Founded in 1975 we have more experience in usability testing than any other U.S. consulting firm. We have conducted 2500+ usability studies from Wall Street to Main Street. We have working knowledge of all core research methodologies and are well known for complex, customized usability testing programs that address business-critical problems. Executed several generations of complex usability studies focused on optimization of web-based home banking applications. Developed and executed overall and detailed guidelines for execution of consumer usability studies in global markets. Produced several ongoing usability and brand engagement optimization programs for new online customer service applications. Conducted extensive, complex longitudinal UX testing on core MTV.com site over a 3-year period. Developed UX optimization strategies and provided conceptual direction for modifications to site over several iterations. Site performance increased from 5th to 1st on ComScore ratings over the period of optimization. In a multi-year effort, MNM executed complex human factors engineering research and workstation / user interface design programs resulting in creation of new generation of mission control centers for NASA Space Shuttle operations. Solutions resulted in verified improvements in critical launch information display and operator mission management including cross-training and task sharing functions. Solution propagated to Shuttle operations centers on a global basis. MNM received NASA Special Service Citation for this effort. In numerous multi-year engagements, MNM conducted complex human factors engineering research and product design programs for leading medical and pharmaceutical entities covering imaging systems, drug delivery devices, emergency care / ICU systems and surgical devices with a focus on both software driven, screen-based interfaces and hardware configurations. MNM has executed large sample formative and summative studies for FDA approval. MNM received the Alexander C. Williams Award / Human Factors and Ergonomics Society for medical systems design. MNM has provided consulting and testifying expert services for design patent, utility patent, trade dress and copyright matters covering GUI design and product design. We have participated in over 75 major cases on behalf of the world’s most successful high-technology companies and work routinely with leading law firms. We speak at major IP conferences and are on the planning board for USPTO conferences. Mr. Mauro was the first design/research professional invited to speak at the UC Berkeley Federal Judicial Center training seminar for federal judges. The firm has provided critical content for a number of recent high-profile amicus briefs related to design patent rulings at the Federal Circuit. We have also taken a leading role in production of one of the high-profile briefs for SCOTUS in Apple v. Samsung. Executed research and design programs involving transfer of desktop functions to app-based environments and creation of new app-based products. Specialized experience with cross-platform media consumption and deep content navigation in app interfaces. Executed usability and UX/UI interface design programs covering financial services, gaming, music, e-com and other major industry sectors. Created tablet-based UI framework for use in tracking asset variance based on freshness of data and projected asset value models. Produced new highly interactive data visualization UI framework for rapidly exploring complex data sets and improved asset management and board-level decision-making. Created robust simulations and related data presentation schemes. Executed cognitive task analysis and detailed ergonomic research programs related to optimization of wearable products and UI design configurations for a wide range of devices. Executed important early research on the complexity of wearable interfaces and provided detailed methodology for interaction simplification through application of transfer-of-learning concepts and related human factors engineering principles. Based on execution of detailed competitive market and product analysis covering UX design innovations in the music technology sector, created a strategic UX innovation framework for addressing dramatic increases in competition brought about by a new major entrant to the online music technology space. Proposed to top management realignment of strategic thinking related to experience optimization of core products and services. Proposed robust user-centered development methodology for increasing competitiveness on a global scale. MauroNewMedia has an unparalleled history in mobile UX / UI design including early work on display pagers, emergency radios, PDAs, cellphone, tablets and smartphone interfaces. Our solutions have contributed to some of the most successful mobile products in history. We have served as consulting and testifying experts for the world’s leading mobile product companies. Today we continue to consult on new mobile products and related services including apps, for which UX performance is business-critical. Created specialized sub-miniature, personalized online banking security device that allows for complex highly secure financial transactions through interaction with 2-line display UI. Executed detailed task analysis of trading functions on floor of NYSE over 3 month period. Developed hardware/display design configuration for first successful hand-held trading systems used on floor of NYSE. Development focused on cognitive and biomechanical aspects of hand-held device design. Produced simulations and executed user verification testing of device configurations. Solutions employed as templates for HHD device design. Conducted global market research audit of UX configurations for 350+ cellphones and smartphones. Identified trends in UX configurations and interaction frameworks based on OS functionality and market size / penetration. Developed detailed UX optimization strategy for cellphone and smartphone market based on current and projected trends in UX behaviors and modes of use. Executed complex projects focused specifically on optimization of hand-held products and related applications. Have undertaken extensive HFE analysis, design and testing of hand-held product design applications covering trading interfaces, surgical devices, drug delivery devices and hand controls (many applications). Clients include: Apple, Motorola, Samsung, Pfizer and other leading entities. Conducted product design programs for leading consumer product entities including execution of complex consumer needs analysis, product concept development, simulation design and user testing for consumer electronics, personal care, health and beauty, cosmetics, major appliances, furniture and fixtures. Clients include Sony, LG, Apple, Philips, Samsung, Este Lauder, Ralph Lauren and other leading entities. Executed product design programs for leading medical and pharmaceutical clients covering complex clinical modalities including: imaging, drug delivery, surgical, emergency processes and patient management systems related to FDA HE 75 requirements and testing procedures. Clients include Pfizer, Becton Dickenson, Johnson and Johnson, Raytheon, GE and others. Executed large-scale human factors engineering analysis and design development programs covering open office systems, lighting and seating for leading contract manufacturers including Steelcase, Herman Miller, Knoll, Haworth, KI International. Working with leading architects, also executed complex, large-workgroup research and space planning programs for specialized corporate functions including R&D, engineering, marketing and product design teams at various world headquarters for major corporate clients. Have undertaken complex projects in the process control industry: paper and sheet material production, electric power generation (fossil and nuclear), mining, large-scale pumping applications and telecommunications. Field research has included work with represented workers in several industry sectors. Clients include: Weir Minerals, Louisiana Power and Light, New Jersey Power and Light, ABB Accuray and others. Executed product design projects related to emergency systems including hardware and software applications. Experience includes communications devices, event tracking systems and displays (fixed and display-based), injury support devices and related hardware and emergency HFE process design. Clients include: Motorola, ADT, AT&T, Ebasco Services and other entities. In collaboration with leading architectural firms created executive office configurations based on advanced ergonomics and decision. MNM developed ergonomic executive workstations to reduce existing instances of repetitive motion disorders in top executives. Also provided furniture/fixture specifications for special applications and tracked solution performance through on-going executive surveys. Conducted extensive user needs analysis with Shuttle communications teams. Developed enhanced workstation and workgroup solutions. Produced extensive, full-scale simulations and related human factors performance verification testing. Provided detailed control room layout design to improve cross-task workload sharing and during critical mission transitions and related training. Working in collaboration with NM engineering MNM executed complex cognitive task analysis of power management grid during normal and extreme load conditions. Provided detailed HFE enhancements to visual display design, operator training and control room layouts for critical facilities on power grid. Verified performance through simulation and user testing. Working with multiple large engineering teams executed complex human factors analysis and design solutions for several generations and numerous categories of heavy industrial and farm equipment operator environments and cabs based on US and International safety and ergonomic standards. Integrated new complex GPS-based automation systems into operator decision flows through HFE analysis and simulation development. Executed on-site research with machine crews in high volume production environments. Developed harsh-environment workstation design integrated with HFE optimized GUI. Design solution provided machine crews with highly flexible and secure workstation for management of complex machine functions including visual and physical access to critical information at long viewing distances and in rapid response frameworks. Working with large internal engineering team executed complex ergonomic analysis of micro-assembly task with high previous incidence of ergonomic factors. Created new ergonomic workstation design that mitigated or eliminated key risk factors. Trained large internal team on ergonomic science and applications. Tested all solutions for ergonomic performance over several iterations using advanced testing methods and sampling strategies. Executed complex formative studies across a wide range of medical devices covering hardware, software, drug delivery, surgical and imaging modalities. Worked with large internal client teams as a highly experienced HFE subject matter and usability testing resource. Created and oversaw complex SOWs, protocols, and related IRB approvals. Highly effective with complex, iterative, large sample formative studies based on AGILE development methods. Mobile apps that interface with human biomedical variables are now slated for FDA oversight. In this new field of man-machine development we work with our clients to ensure that FDA guidance related to human factors engineering performance is documented and employed in the development of app-based systems that must respond to FDA oversight. MUS provides subject matter expertise, HFE audits, cognitive task analysis, UI design and formal usability testing during development to confirm HFE performance is verified and documented before, during and after approval by the FDA. Conducted several usability testing programs for MarchOfDimes.com focusing on optimization of mission-critical engagement pathways. Executed studies utilizing both a small-sample lab-based methodology and large-sample online behavior tracking. Provided detailed optimization recommendations for improving giving conversions and access to critical content on the site. Conducted largest virtual-world user engagement analysis to date. Executed studies that tracked in-world UX design versus real-world brand engagement behaviors for leading global brands. Created first deep understanding of psychological binding between avatars’ and users’ real world identities. Studies utilized 6+ terabytes of data covering 6 virtual worlds. We specialize in design, approval management, execution and delivery of large sample rapid-response summative usability studies. MUS routinely delivers robust studies with 500-1000 respondents in compressed time frames. We are well known for the quality of our research methods and compliance-related performance for clients facing complex FDA approvals. MUS is a preferred vendor for leading biotech, pharmaceutical and medical device manufactures. We are fully versed in CFR 21 Part 11 compliance requirements and maintain research methods within compliance. Designed and executed complex study to determine the effectiveness of the pedestrian warning system known as the LOOK! campaign funded by NYC DOT. This study utilized existing and updated observational methods and mental models of pedestrian behavior to determine whether or not the proposed graphic warning system was effective. Study produced robust insights into NYC pedestrian behaviors as a function of the LOOK! solution and other factors. This research was funded by Mauro Usability Science in conjunction with the New School for Social Research. Working with DOD development teams and large aerospace contractor executed complex professional HFE heuristics analysis of military recruit intake processing on a national basis. Conducted detailed task analysis of existing process, identified key usability and visualization factors and provided detailed recommendations for HFE enhancement of process, software/display design, user training and system management. Executed detailed ergonomic task analysis of product design task functions for Tiffany and Company. Created adjustable workstation configuration optimized to reduce repetitive motion disorders in the use of high-end CAD programs and related software. Produced full-scale mockups and conducted user verification testing. Coordinate final production for 45 workstations and layout of entire department. Conducted ergonomic task analysis of micro-level jewelry production and polishing tasks. Created standardized ergonomic evaluation methodology and produced robust solutions for design of new jewelry production workstations. Solutions produced dramatic reduction in workplace ergonomic related health factors. Design verified through extensive user testing. Coordinated production of complex workstation solution. MauroNewMedia recieved the 2013 Stanley Caplan User Centered Design Award. Working in conjunction with large engineering teams and consultants executed complex ergonomic analysis projects in the power generation sector. Programs included control rooms, testing equipment, tools, component parts and process/procedure design for clients including: Consolidated Edison, New Jersey Power and Light, Louisiana Power and Light, Weir Minerals…and others. Prior to development of advanced ergonomic workstation for the Longaberger company MNM executed a complex micro-level task analysis for production of high-end basket making. The analysis focused on formal identification of risk factors and production performance variables that could be mitigated or reduced through enhanced workstation design and training. Research lead to design of new production workstation. Executed comprehensive ergonomic analysis of 14 leading “ergonomic” task and executive chairs from 9 leading manufacturers. Prepared formal ergonomic rules-based evaluation process and conducted detailed audit of all chairs in structured setting. Produced detailed ergonomic ranking of seating systems. Data utilized by large clients in purchase decisions related to seating systems for facilities installed on global basis. Executed extensive ergonomic analysis and optimization of a wide range of hand-held industrial tools and related use procedures and training. Conducted ergonomic analysis in wide range of industrial settings and production environments on a global basis. Produced extensive recommendations for improvements to hand-tool design and related proper-use training guides. We have executed groundbreaking ergonomic analysis programs for complex hand-held medical devices for consumer and commercial drug delivery systems. These programs included development of ergonomic product performance measures fully verified through rigorous user testing based on IRB approvals. These projects included development of proprietary 3D device tracking and ergonomic optimization processes. Conducted on-site field research covering complex ICU procedures related to patient hydration systems, monitoring devices and HCP training and device management processes. Developed new sterile water hydration system that reduced critical set up and utilization errors and reduced training for HCPs. Patents awarded for solution. Conducted extensive professional human factors engineering heuristics on complex medical products, drug delivery devices, imaging systems, patient EMRs and related processes. Created and utilized specialized heuristics rule sets directed at FDA HE 75 guidelines. Provided extensive design optimization recommendations with verified HFE performance improvements. Clients include GE, Johnson and Johnson, Pfizer and others. Medical packaging is viewed by the FDA as a critical component of usability and must be considered in the HFE evaluation of drug delivery devices and products. We work with leading clients to ensure that FDA guidance human factors engineering performance criteria are documented and employed in the development of packaging for FDA approval. MUS provides subject matter expertise, HFE audits, information analysis, cognitive task analysis and formal usability testing during development to confirm HFE performance is verified and documented before, during and after approval by the FDA. If you must perform rapid-response usability testing utilizing live drugs and related production or prototype delivery mechanisms, we can execute your programs in a safe, efficient and productive manner. We have extensive experience with the special problems and operating procedures required to conduct usability testing under these complex conditions. We are especially adept at complex SOWs, protocols, and related IRB approvals and have a history with complex, iterative, large sample formative studies utilizing live drugs and production devices. If you are facing a complex, business-critical and time-sensitive FDA response, we specialize in providing highly focused and experienced usability testing and human factors engineering optimization expertise. Our experience and focus is on addressing such matters as rapidly and rigorously as possible. We have a track record with these complex problems. Conducted extensive in-field research at leading US medical centers related to radiological procedures and patient handling factors. Created optimization strategy for improving both patient safety and department-level throughput. Provided extensive input into man-machine aspects of several lines of new medical imaging systems. Conducted on-site usability testing and concept verification studies.